"BANKERS get a rather bad press nowadays, being blamed for the financial crisis that is hitting much of the world. Does St Anthony offer us any guidance in our stewardship of money? In his day, banks in our modern sense did not exist – the modern system only began, I suppose, with the great financial houses of Florence and elsewhere, during the 14th century. From Roman times, most banking activities were conducted by private individuals, not by large banking firms such as exist today; anybody who had spare capital and wished to lend it out could do so. According to one historian, “Moneylending… was largely a matter of private loans advanced to persons short of cash, whether persistently in debt or temporarily until the next harvest. Mostly, it was undertaken by exceedingly rich men who were prepared to take on a high risk if the profit looked good; interest rates were fixed privately and were almost entirely unrestricted by law. Investment was always regarded as a matter of seeking personal profit, often on a large scale. Banking was of the small, back-street variety, run by the urban lower-middle class of petty shop-keepers.” But as the Roman Empire declined, such small-scale banking became uneconomic, and it was of course the rich who were in a position to take advantage of the situation. The first Council of Nicea forbade the clergy to engage in usury, defined as lending at a rate of more than 1 percent per month. Later Councils extended the ban to the laity. In the 12th century, the second Lateran Council (1139) issued a very strong declaration against usurers. 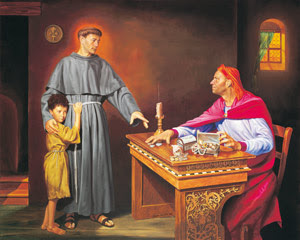 This may have referred only to immoderate or habitual usury, and not against usury in general, but to remove all doubt the third Lateran Council (1179) decreed as follows: “Since almost in every place the crime of usury has become so prevalent that many people give up all other business and become usurers, as if it were lawful, regarding not its prohibition in both Testaments, we ordain that manifest usurers shall not be admitted to communion, nor, if they die in their sins, be admitted to Christian burial, and that no priest shall accept their alms.” This, then, was the Church legislation at the time of St Anthony. St Anthony’s writings contain many harsh condemnations of usury. In the very first of his Sermons, for Septuagesima, the Devil himself is represented as an ‘exactor’, “who once offered the coin of sin to the first parent and now ceaselessly demands daily repayment with usury.” The picture is clear – a usurer is a hard-hearted man who harasses the poor with daily demands for repayment. Elsewhere usurers are compared to reptiles (‘creeping things’), blood-suckers, and even leprosy. They are deaf to the cries of the poor, and to the warnings of preachers. They ‘spread their nets’ to catch great and small, rich and poor. They have stony hearts. They are like the teeth of lions, grinding the poor. The Saint’s most extensive treatment of the social effects of usury comes in his commentary on the Gospel of the sower on Sexagesima Sunday. The avaricious usurer is like the thorns or wild beasts that catch and tear and draw blood. “They have already taken the whole world into their hands. Because of these usurers, churches are impoverished and monasteries stripped of their goods.” It was not just poor individuals who were in trouble, but even well-established institutions. The usurer “seizes the goods of the poor, of orphans and widows, and chews them up and swallows them. He makes the vineyard, God’s Church, a desert when he holds on to its possessions as pledges of usury. He barks, strips and spoils the Lord’s fig-tree (any religious house) when he appropriates to himself the goods given to that community by the faithful.” Such abuses must have been widespread for the Saint to write in this way. The financial system today is far more complicated than it was in the 13th century, but it is still subject to moral appraisal. The first question is whether a system entirely based on lending at interest is morally sound. The Book of Deuteronomy says, “Thou shalt not lend upon interest to thy brother: interest of money, interest of victuals, interest of any thing that is lent upon interest. Unto a foreigner thou mayest lend upon interest; but unto thy brother thou shalt not lend upon interest; that the LORD thy God may bless thee in all that thou puttest thy hand unto, in the land whither thou goest in to possess it.” (Dt 23:19-20) This allowed charging interest to a stranger, but not to a ‘brother’; but what if we are all brothers? A modern commentator has asked whether our current troubles are the direct consequence of an interest-based banking system. People believed that property values would continue to rise, and so borrowed on the assumption that such a rise would fund the interest on the loan. As long as interest rates were low, this was sustainable – but with property losing its value and interest rates rising, a crash was bound to come. The wealthy and well-advised could restructure their assets, but the small home-owner had no such option. Inevitably the poor suffer more than the rich. Globalisation, too, has led to a loss of resilience. Chains of supply are long, and more subject to financial vagaries. Public authorities cannot wash their hands of responsibility for regulating the system. In modern capitalism the role of money has undergone a shift. Its primary role is no longer simply to facilitate the exchange of goods. It has become a commodity in itself. Money alone generates more money, and the principle of usury – defining it as the lending of money at real positive rates of interest (i.e. rates greater than what is needed to cover inflation and risk) – is the inner wheel driving the system. This was precisely why medieval theologians rejected usury – it ‘made money breed’, whereas it was by nature sterile. This was (for them) a ‘sin against nature’. Undoubtedly there is truth in much of this analysis. But for St Anthony, and for us, there is a simpler test. We are all children of the heavenly Father, brothers and sisters of Jesus Christ. We are strictly bound to love one another as we love ourselves. The Saint was not interested in ‘systems’. What he could see clearly was rich and powerful people using their position to enrich themselves further at the expense of their poorer brothers. What he could see was a lack of compassion, a failure to recognise Christ in the other person. Our Lord said that we should lend without expecting a return – not, of course, that we should not expect the return of what we lent, but that we should expect nothing over and above. Today, when lending is a business, it is legitimate to charge for the service rendered – staff must be paid and other overheads met. That is fair enough; but no-one, whether in business or in private dealings, is exempt from the Law of Charity. In his Sermon for the feast of St Stephen, Anthony notes that the avaricious and usurious pay no attention to the state of their life, its entry and its exit. They paid nothing to be born, they can take nothing with them when they die. “Where do they get all their possessions from?” he asks. “From robbery and fraud.” He quotes the prophet Habbakuk: “Woe to him that heapeth together that which is not his own.” Then, in typical fashion, he offers an amusing simile for the rich moneylender. “He is like the dung-beetle, which gathers much dung and with great labour makes a round ball; but in the end a passing donkey steps on both beetle and ball, and in a moment destroys it and all it laboured so long over. In the same way the miser or usurer gathers long the dung of money, and labours long; but when he lest expects, it the devil chokes him. And so he gives his soul to the demons, his flesh to worms, and his money to his family. The banker as beetle! There’s a thought!"